Beginning June 20, the Market Cart at the base of campus will be open from noon to 6 p.m. on Tuesdays and Fridays. Celebrate the start of summer on Tuesday, June 20, when the Farm & Garden’s Market Cart opens for 2017, marking another abundant season of fresh, delicious organic produce and beautiful flowers. The Market Cart, located at the corner of Bay & High Streets at the base of the UC Santa Cruz campus, is open from 12 noon – 6 p.m. on Tuesdays and Fridays. On opening day, you’ll find organically grown strawberries, summer squash, lettuce, arugula, salad mix, and a variety of cooking greens including kale, baby pac choi, spinach, chard, and collard greens. Flower bouquets will also be available. All the produce is organically grown at the UC Santa Cruz Farm and Alan Chadwick Garden by staff and students in the Apprenticeship in Ecological Horticulture, a farmer and gardener training program of the Center for Agroecology and Sustainable Food Systems (CASFS). Proceeds from sales support the apprenticeship program, now in its 50th year. On July 28–30, CASFS will mark its golden anniversary with a “First 50” celebration, including workshops, music, tours, and a celebration banquet. Find out more at casfs.ucsc.edu. The Market Cart will be open through mid November (weather permitting). For more information, call (831) 459-3240 or email casfs@ucsc.edu. 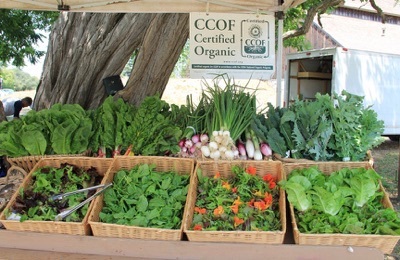 Read more about the Farm & Garden’s produce and flower sales options at casfs.ucsc.edu/community/produce-sales/index.html. For more information on CASFS activities at the UCSC Farm & Garden, see casfs.ucsc.edu.